3 ways to describe Mario VS Donkey Kong: Minis March Again: "Fun, Challenging and Strategy." Strategy: This is a puzzle game. You definitely need strategy to complete your mission. What is your mission? " Rescue Pauline using the mini Marios." You use your stylus in forming blocks, rotating pipes, activating the minis and etc. There is also a time limit for every stage. If you don’t use strategy you’ll end up crushing the minis ( oh! poor minis…). Challenging: If you are up to a challenge, and you feel very confident on puzzle games, try playing this game on 'plus' mode. I consider some levels of the game as brainteasers that could increase your catecholamines. Fun: If you want to have fun and enjoy a short game, try this game. I got this game after I purchased my DSi XL. I have wonderful memories with this game, I love the mini Marios and their sound effect when you activate them ( super cute). The first levels are really easy ( I played it on normal mode though). If you want extra challenge, well you can try to unlock all the basement levels. The platform are well designed you’ll definitely love the graphics. The music of this game is nicely done. Most of them are remix from previous Nintendo games Donkey Kong Country theme "Princess Peach castle" Super Mario Brothers and etc.. You also have an option to listen to the music tracks. 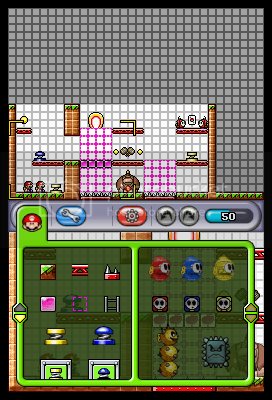 You have a choice of building your levels, you can use mini Mario and other characters. Finishing the normal mode level will unlock more items that you can use in construction zone. 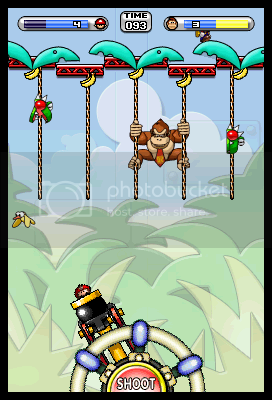 It is also funny to hear Mario's voice when you open or close DSi, one of my favorite phrases is " Come back here you big-a monkey." To sum up my game experience: "A very fun game, that will challenge your game strategy." Your first review Snorlax! It's good to hear you enjoyed this game. I haven't downloaded this one myself, but a challenging puzzle platformer kind of game sounds very good. There's a lot of DSiWare games I want to check out on my 3DS. 'Catecholamines'... Now there's a word I've never heard of. I had to look it up! Congrats on your first review! I've always stayed away from this series because I wasn't sure if the gameplay was any good. I just preferred the Donkey Kong gameplay instead of the mini gameplay. I might give it a try one of these days though. Cool! 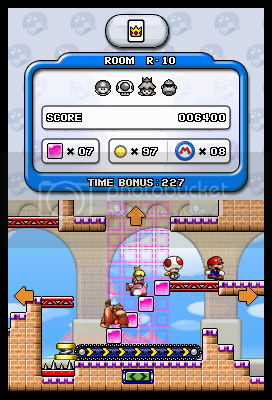 I haven't played this DSiWare game, but I can recommend Mini-Land Mayhem, which released late last year. It's the sequel to this game, in a very similar vein. Yeah, this game is awesome. Definitely one of the best on DSiWare. An awesome game indeed. The Basement levels sure humbled me. @Guillaume Me and my niece messed around with the level maker but you know... she is 6, so mostly they ended up super basic. Awesome game though. Pretty packed for being a downloadable. I do really want to play Mini Land Mayhem when it came out but I just can't find time, why did you gave it a 8.5 score instead of 10.0? I constructed my own level, unfortunately I was not able to share it. I made one level. Great game! Have you guys played March of the Minis? That was NOT such a great game. It was like the modern workplace. Too much micro-management. Wait, so this game is actually good? I'm confused--I keep hearing how people have been disappointed in MvDK since they stopped being platformers. The first Lemmings-like (March of the Minis) kind of stank. The other two are good. But some people are still (understandably) disappointed because they aren't platformers. Thanks for this review. I've been on the fence about this one, though it's on my wish list. This will be my next DSiWare purchase. 8.5 is pretty solid in my book. I just find the repetitive nature of the game prevents it from reaching higher. You might want to wait for the free GBA game later this year.